UFC 197, the pound-for-pound king, Jon “Bones” Jones, returns to the Octagon as he faces off against Ovince Saint Preux for the interim UFC light heavyweight title. Plus, UFC flyweight champion Demetrious “Mighty Mouse” Johnson defends his title for the eighth time against U.S. Olympic Gold Medal-winning wrestler Henry Cejudo. 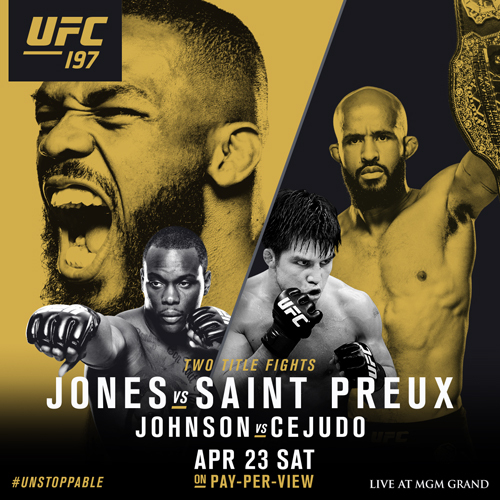 Order UFC 197: Jones vs. Saint Preux – live on Pay-Per-View this Saturday at 10pm/9c. Register below to win UFC 128 on DVD!